Saturday January 12th 2019: Etape 11 AKJOUJT / ST LOUIS: 556,20km Start from the bivouac Leg: Akjoujt / Fimlit: 217,69km Liaison: Fimlit / St Louis: 338,51km As usual, this final Mauritanian special sector will be relatively short to not waste time and enable everybody to join the St Louis Bivouac by sunset. Most part of the track will be sand tracks between the dunes with a just a few nice crossings in the first part. 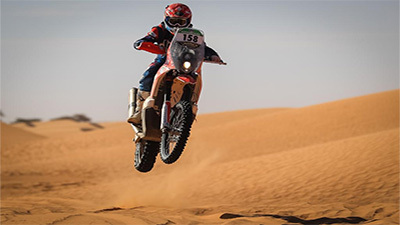 The second portion of the special sector should allow competitors to beat speed records, but they will need to focus until the arrival in Fimlit, near Nouakchott, to try and be part of the top three on the podium. The last 300km of the stage, with beautiful driving along the Senegal river and the border, will enable participants to meet with friends and family at the bivouac set up on the old aerodrome of Saint Louis.